I've been busy working on some new pieces for my Fair Isle jewellery range and I'm excited to share the first of my new Fair Isle necklaces! I hand knitted the necklace to my own Fair Isle design in beautiful British wool and the knit encapsulates light wooden beads that tie with ribbon. This is my first prototype of Fair Isle necklace in this style and I am going to experiment with other colours and designs to add to my Etsy and Folksy shops soon. I'll keep you posted! 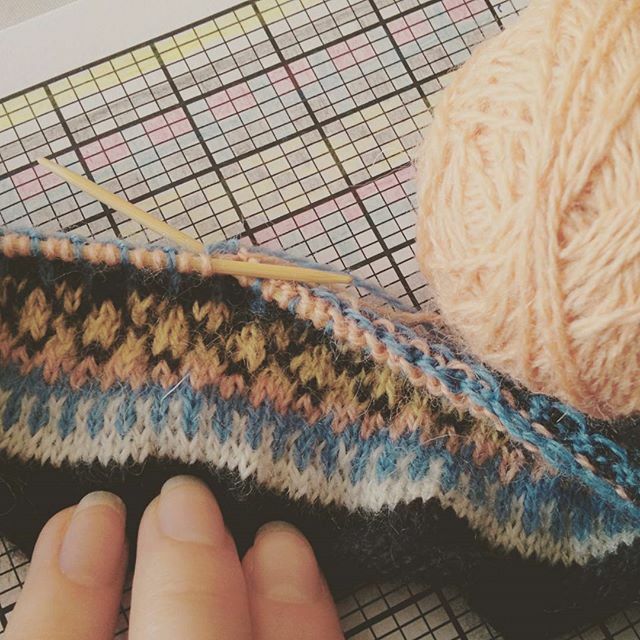 I find the Fair Isle process very therapeutic and very rewarding. One of the reasons I love knitting so much is because you are creating your own fabric. Maybe one day I'll go one step further and try spinning my own yarn! This is a real statement piece that can be dressed up or down and is a great way to wear wool every day! The nature of the design means the necklace is reversible, so you have two looks in one! You can check out my other Fair Isle necklaces and brooches here. Watch this space for more new designs!